In January 1998 a new solar neutron detector was installed at Gornergrat, Switzerland, as the European cornerstone of a worldwide network for the study of high-energy neutrons produced in energetic processes at the Sun. In the following the principles of the apparatus and its significance within the worldwide network of solar neutron detectors established by the Solar-Terrestrial Environment Laboratory of the Nagoya University are discussed. In contrast to charged particles emitted in association with solar flares and coronal mass ejections neutrons are not affected by the magnetic field of the Sun, nor by the interplanetary magnetic field, nor by the geomagnetic field. Observations of solar neutrons therefore offer a direct insight into the mechanisms of high energy processes at the Sun. The additional possibility to measure the energy spectrum of the neutrons gives information about the timing and the duration of the high energy solar processes. This allows to get a better understanding of the acceleration mechanism of charged particles at the Sun. This information, along with measurements of solar gamma ray emission and charged particles, is the basis for building solar flare models. The first identification of a solar neutron event by ground-based detectors on 3 June 1982 (Debrunner et al. 1983; Chupp et al., 1987) initiated extensive theoretical and experimental work on the production of solar neutrons during high-energy processes at the Sun, their propagation to 1 AU, and their detection near and at the Earth. One part of the activities was setting up standardized neutron monitors at favorable observational locations, such as Haleakala, Hawaii (Pyle and Simpson, 1991). Another part was the development of new ground-based detectors with enhanced sensitivity for solar neutrons (e.g. Shibata et al., 1991; Muraki et al., 1993). Fig. 1: Worldwide network of solar neutron telescopes. The solar neutron detector at Gornergrat was installed in 1998. To arrive at their alpine destination at Gornergrat, the detector components made an ocean journey from Nagoya to Rotterdam, moved to Basel by Rhine barge, were then transferred to Zermatt by train, and finally flown to Gornergrat by helicopter. At Gornergrat the detector was installed in a laboratory container in close proximity of the Kulm Hotel, which houses two astrophysical observatories of the International Foundation High Altitude Research Stations Jungfraujoch and Gornergrat. It is expected that the new detector will play an essential role in the study of solar neutron events during the active phase of solar cycle 23. The detector at Gornergrat is similar in type to the ones operating in Bolivia and Armenia (Matsubara 1997a). The configuration is illustrated in Figure 1. The detector can discriminate neutrons from charged particles. It is capable of providing information about the energy of incoming neutrons by measuring the energy deposition along the total track length of recoil protons produced inside the plastic scintillators by elastic n-p and inelastic n-C reactions. The detector has an effective area of 4m2. It consists of a horizontal matrix of four 1m x 1m x 0.4m plastic scintillators. Scintillation flashes in each scintillator are collected by a photomultiplier (Hamamatsu R1512). 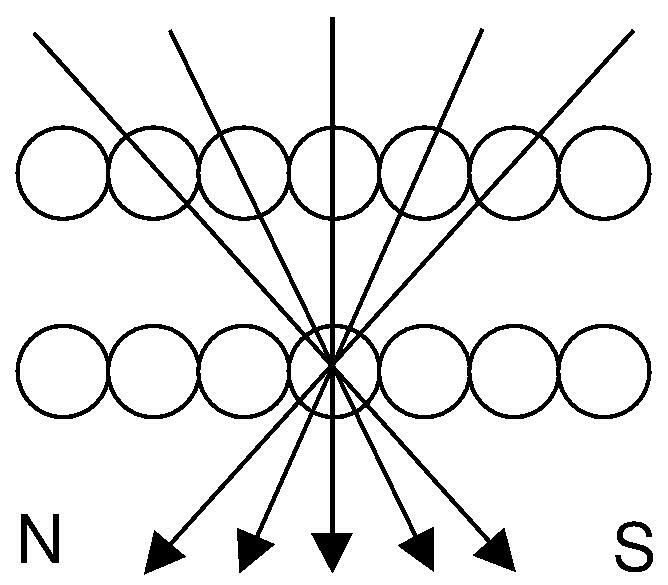 The pulse height obtained by each photomultiplier is discriminated at four levels, which at present correspond to an energy of a recoil proton of >40 MeV, >80 MeV, >120 MeV, and >160 MeV. The scintillators are surrounded at the top by 20 and at the sides by 64 proportional counters which veto charged particles. Neutrons are identified by the scintillators in anticoincidence with the veto counters. For the determination of the direction of incoming neutrons, two layers of 20 proportional counters each were added at the bottom under the plastic scintillators. The active length of these proportional counter tubes is 185cm. The proportional counters are aligned in the east-west direction and the vertical displacement of the two layers of counters is 23cm. Fig. 2: Configuration of the Gornergrat solar neutron detector. The direction of recoil protons is determined by measuring coincidences between two counters of the two bottom layers of proportional counters. The arrival directions of neutrons are classified into 5 bins. Coincidences between two counter tubes, one in the upper and one in the lower layer with -2, -1, 0, +1, +2 horizontal counter tube displacements are measured. With this configuration a rough distinction between the following zenith angle regions is possible: around 40°N, 25 °N, 0°, 25 ° S and 40 °S. To assure that only the direction of recoil protons produced by a neutron will be counted, the input to the direction counters is in coincidence with the channel E >40MeV of the scintillator counters with veto. Therefore, pulses are only counted if there is simultaneously also a count signal from a photomultiplier, but not from a veto proportional counter. Fig. 3: Cross-section in the north-south direction of the bottom proportional counters illustrating the principle for determining directional information. For details see the text. After proper amplification and discrimination the signals of the photomultipliers and of the proportional counters are counted in two 16-channel 100 MHz CAMAC scalers (N-TS 112). Every 10 s the scalers are read out by a PC9801RX. Periodically, recent data are transferred to the harddisk of a Solaris UNIX PC (FM-V). Completed one-day files (~ 6.24 MB) are finally saved on an EXABYTE tape. Accurate time is taken from GPS, whereas barometric pressure information is obtained from a nearby weather station. Via leased communication lines both the PC9801RX and the FM-V are connected to the computer network of the University of Bern. The authors gratefully acknowledge the support by the Grant-in-Aid for for Scientific Research on Priority Area (B) of the Ministry of Education, Science, Sports and Culture, No 11203204, Japan, the Swiss National Science Foundation (Grants NF 20-050697.97, NF 20-057175.99 and NF 20-067092.01), the Burgergemeinde Zermatt, the International Foundation High Altitude Research Stations Jungfraujoch and Gornergrat, the Brig-Visp-Zermatt Railway Company and the Gornergrat Railway Company. Bütikofer, R., E.O. Flückiger, Y. Muraki et al., The upgraded solar neutron detector at Gornergrat, 27th ICRC, 2001. Chupp, E.L., H. Debrunner, E.O. Flückiger et al., Solar neutron emissivity during the large flare on 1982 June 3, Ap. J. 318, 913-925, 1987. Flückiger, E.O., R. Bütikofer, Y. Muraki et al., A new solar neutron telescope at Gornergrat, in Medina, J. (ed. ), rayos cosmicos 98, Proc. 16th European Cosmic Ray Symposium, Departamento de Fisica, Universidad de Alcala, Spain, 219-222, 1998. 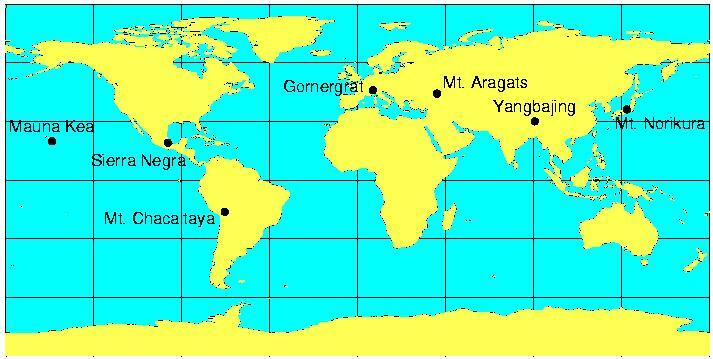 Katayose, Y., K. Izu, M. Ohnishi et al., A solar neutron telescope in Tibet, 26th ICRC, 6, 58-61, 1999. 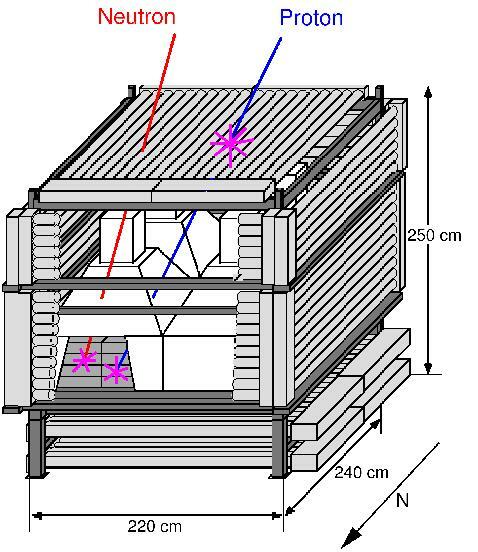 Matsubara, Y., N. Tajima, F. Kakimoto et al., New Bolivia solar neutron telescope, 23rd ICRC, 3, 139-142, 1993. Matsubara, Y., Y. Muraki, S. Sakakibara et al., A new solar neutron telescope in Hawaii, 25th ICRC, 1, 37-40, 1997. Muraki, Y., T. Takahashi, Y. Matsubara et al., The properties of Norikura solar neutron telescope #2, 23rd ICRC, 3, 171-174, 1993. Muraki, Y., Y. Matsubara, S. Sakakibara et al., The 64m2 solar neutron telescope at Norikura, 25th ICRC, 1, 53-56, 1997. Pyle, K.R. and J.A. Simpson, Observation of a direct solar neutron event on 22 March 1991 with the Haleakala, Hawaii, neutron monitor, 22nd ICRC, 3, 53-56, 1991. Shibata, S., K. Murakami, Y. Muraki et al., The detection efficiency of a new solar neutron telescope, 22nd ICRC, 3, 788-791, 1991. Tsuchiya, H., Observation of solar neutrons by new international neutron detectors, Proc. Cosmic Ray Res. Section Nagoya University, 39, 1, 241-321, 1998.